Friday again. Last week’s heat bubble popped, and the weather is back to normal summer instead of summer in hell. It’s 20 to 30 degrees cooler. 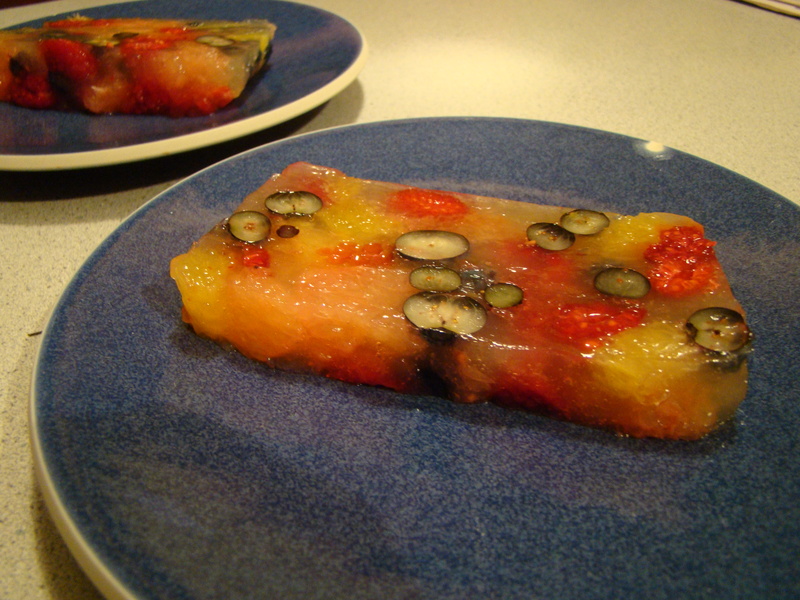 This week’s recipe for French Fridays with Dorie was a dessert called Citrus-Berry Terrine, which is a fancy name for French Jello Mold. OK, it wasn’t exactly French jello, as opposed to American jello. It was much more elegant. 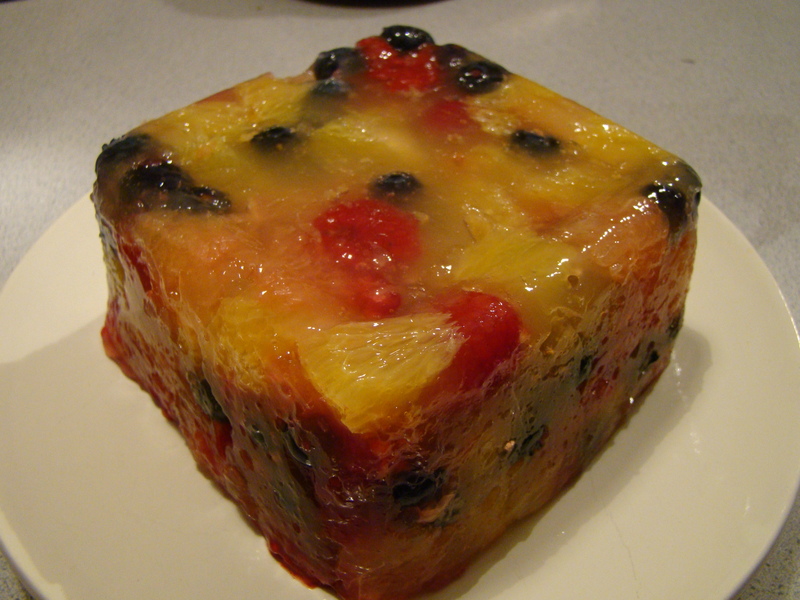 The terrine was based on “homemade” jello, made from gelatin and fruit juice, rather than an artificially flavored, heavily-sweetened box of Jell-O. Plus, the terrine was studded with fresh fruit: orange, grapefruit, and freshly picked berries. I am a child of the 60’s and 70’s, so as most children raised in American suburbs during that time frame did, we ate plenty of Jell-O at our house. Cups of regular jello were a frequent snack. Then, there was the special occasion jello mold that appeared on the table for all holidays and special family dinners. My family’s was a strawberry-flavored Pink Jello Mold, which I still make (and enjoy) today. Back to the terrine… This was a lovely, refreshing dessert. The citrus was tart, and the berries were sweet, giving it a nice contrast. I made a half recipe, using a 5-inch square container. After supreming the orange and grapefruit, I squeezed the juice from the remaining membranes. Then, I made up the difference with grapefruit juice, which is our usual morning juice. Dorie said it would take about 2 hours for the gelatin to get to the consistency of egg whites. I missed the actual point of egg whites, and after 45 minutes, it was way past that. I added the fruit anyway, though I think the fruit would have mixed in better if the consistency had been a little runnier. Last night, my friend Laury and I went to a delicious Persian restaurant for dinner. We passed on ordering dessert, and I served the terrine when we came back to my house. Howard declined to try it, but that was his loss. It was beautiful to look at (though difficult to photograph). Laury and I both enjoyed it. I think it could have been a tad sweeter, so when I make it next time, I would either add a little more sugar (there wasn’t much in the recipe) or use orange juice, which would definitely be sweeter than the grapefruit. I will also experiment with other fruits and juice flavors. Next Friday: Slow-Roasted Tomatoes. Perfect for the season. It’s so nice to have friends as passionate about food as I am. Last week, I got an email from my friend Pat saying that she had an excess of squash blossoms, but they had to be cooked that day. Was I interested? How exciting! I’d never cooked, or even eaten, squash blossoms before. 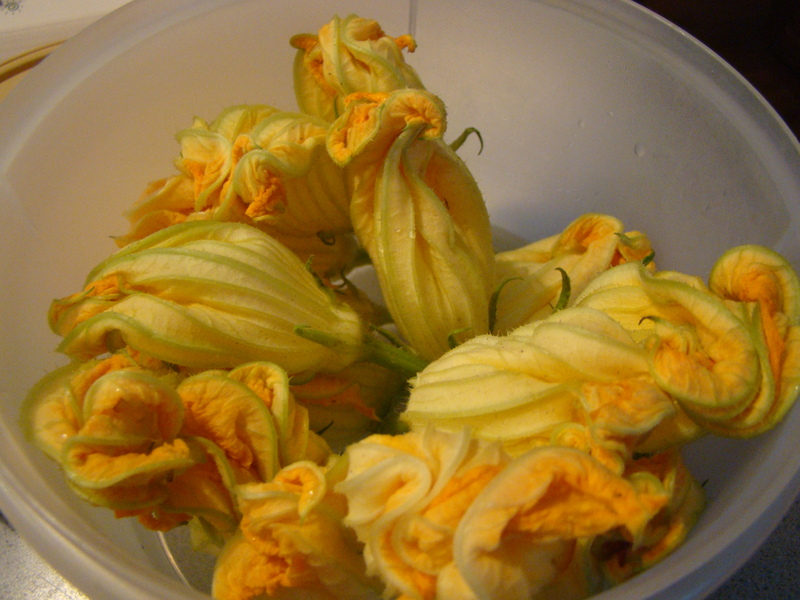 The first time I saw squash blossoms was at a farmers’ market more than a decade ago. They were being sold by the dozen, $1 per flower. That was too dear for me. The next summer, I invested in a 99¢ packet of seeds and planted some zucchini, solely with the intention of harvesting the blossoms and trying. In typical Betsy fashion, I got distracted and lost track of the plant’s cycle. I missed the window where the flowers were ready. We had plenty of zucchini, but no flowers. I swung by Pat’s house after work. She gave me a container of squash flowers, their stems in water, and some advice. These blossoms weren’t from zucchini, like the ones I had tried to grow, but a special variety of squash that produces lots of flowers. Given that squash flowers don’t have much flavor on their own, she recommended a flavorful filling and batter. Pat also showed me her technique for filling the blossoms, cutting a small slit in the side, rather than trying to come in from the top. I asked Howard to pick up some goat cheese on the way home. I mixed the cheese with a handful of chopped herbs fresh from the garden (oregano, lemon balm, thyme and parsley) and some olive oil to make the filling. For the batter, I forgot to ask Howard to pick up milk. I found a simple flour and seltzer batter and went with that. The recommended cooking method was deep frying. Have I mentioned that I’m afraid of frying? I’m nervous about all that hot oil, and I don’t like the splatter. The closest I come is our annual latke night for Hanukkah, but that’s just plain frying with a fraction of an inch of oil in the pan. For the flowers, we’re talking inches. I took a deep breath and carried on. So, I slit and stuffed the flowers. I lost a few, as Pat warned me, as they were a little fragile. Then, I whisked up the batter and heated up the oil. Once the oil was hot, I dipped and twirled the flowers in the batter (the stems make great handles), let the excess drip off, and dropped them in the oil. I cooked them until the batter turned golden. On a few, I lost some of the filling, but mostly, they stayed intact. I drained them on paper towels, a sprinkle of salt, and they were ready to serve. The verdict? Squash blossoms are interesting. Pat was right about them being basically bland, and the flavor coming from the filling and batter. They were special because the flowers are so seasonal and hard to come by. 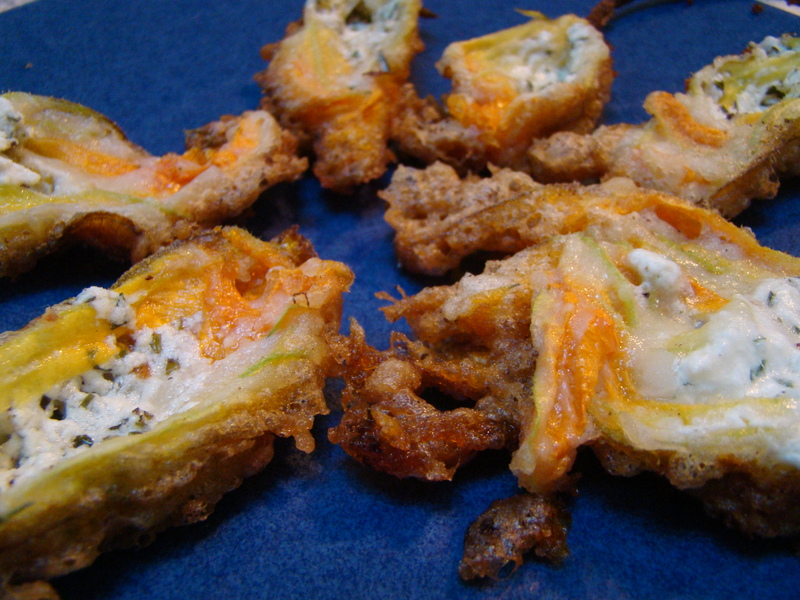 I enjoyed the novelty and finally having the experience of cooking and eating squash blossoms for the first time. Thanks, Pat, for the sharing this memorable summer treat! Prepare filling: Whip the goat cheese, herbs, and olive oil together until well combined. Season to taste with salt & pepper. 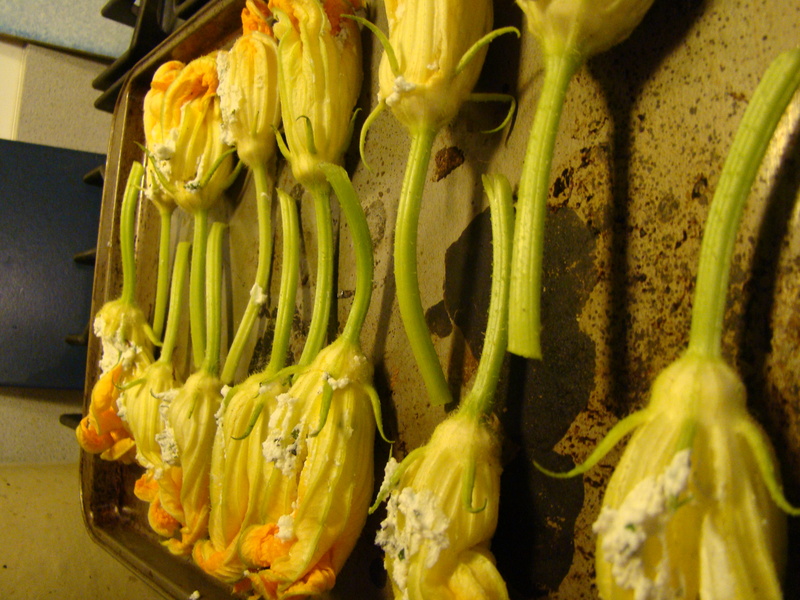 Lightly rinse the squash blossoms and dry them off. Cut a small ¾ inch slit in the side of each flower. Cut out the stamen, if you wish (I did). Stuff the flowers. Using the slit, with a small spoon, place a generous tablespoon of filling inside the flower. Prepare batter: Whisk together flour and seltzer until combined. Heat 2 inches (or more if you dare) of oil in a large pot. Heat until a drop of batter immediately starts to sizzle and brown. (I’m not sure what the exact temperature should be.) Working in batches, dip each flower in the batter, let the excess drip off, then place the flower in the hot oil. Repeat until the pot is full, but not crowded. (I did 5 or 6 flowers at a time.) When the batter turns golden brown (3-5 minutes), use a slotted spoon to transfer the fried flowers to a paper-towel-lined baking sheet to drain. Repeat until all the flowers are cooked. Sprinkle generously with coarse salt.